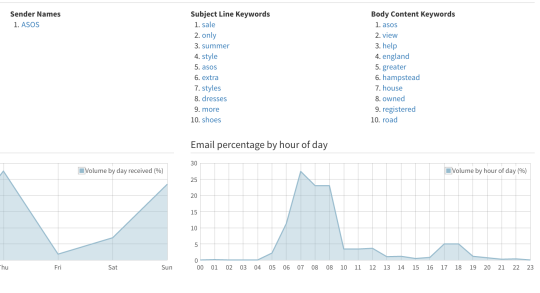 One of my favourite features of Beetle Analytics is the time tracker of when emails are sent out in marketing campaigns. In our fashion research there are two very distinct target audiences, 1, ‘the early birds’ and 2, ‘the late risers’. 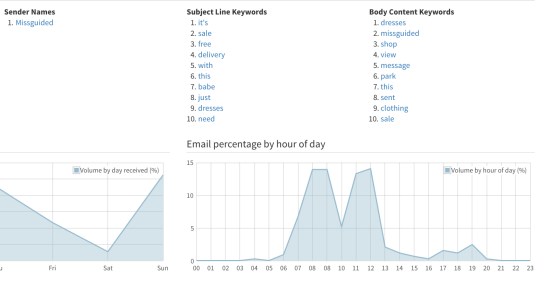 You can see from the graph above 73% of their emails are sent at either 7am, 8am or 9am. This is because they want to reach their audience first thing, when they wake up and quickly check their emails on their phone - giving influence to their style of the day, or when you first get to the office and trawl through the mass of emails you were sent over night, probably mostly from Groupon, I know mine are. Here they can appeal to you as a distraction from the admin that everyone starts the day with, or if you didn’t manage to nail your outfit quite as well as you hoped, they have a range of alternatives available at the click of a button. The timing here indicate their target audience is that of young professional who find that small window of time to check in on the latest ASOS news, either on their commute or first getting to work. This reflects the younger audience they are targeting, they will catch the professionals on their lunch break, but the timings coincide with the later rising young adult they target.